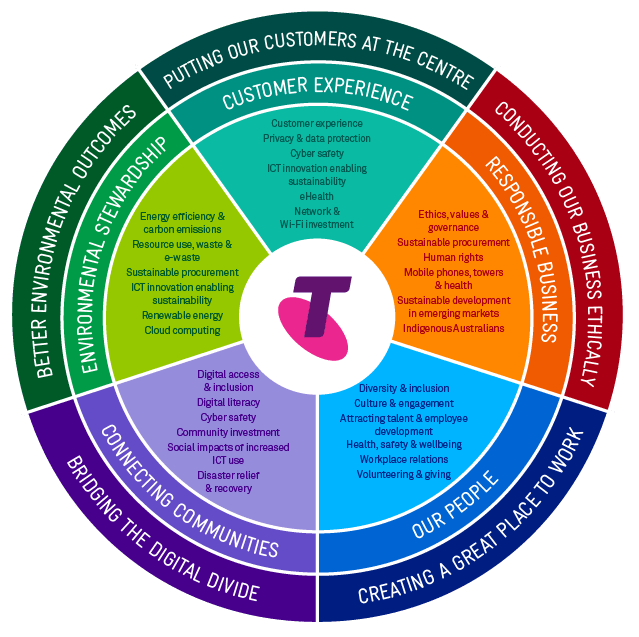 At Telstra, our purpose is to create a brilliant connected future for everyone. The success of our business relies on it, and our sustainability agenda is key to achieving it. We seek to identify ways we can use our technology, expertise, skills and scale to operate more responsibly, contribute to communities and help safeguard the environment. We deliver on this ambition by identifying and responding to the key sustainability issues and opportunities that are important to our business and stakeholders. Understanding and integrating stakeholder values and expectations into organisational decision making is important to help ensure the long term sustainability of our business. We consider sustainability issues, risks and opportunities that come from a wide variety of sources including regular stakeholder consultation, participation in industry and cross sector initiatives, customer research, benchmarking and future trends analysis. We prioritise issues according to their impact on our business and stakeholders. The key topics identified through this process during the 2015 financial year are outlined in the diagram below. This section highlights some of the more significant aspects of sustainability at Telstra. Our Bigger Picture 2015 Sustainability Report, available online at www.telstra.com/sustainability/report, provides a more detailed overview of these issues and our performance. We believe that the more connected people are, the more opportunities they have. We want everyone – regardless of age, income, ability or location – to enjoy the benefits that new communication technologies can bring. Our Everyone Connected programs focus on making our products and services more accessible, enhancing digital literacy and cyber safety and supporting technological innovation for social good. We are working to be more proactive and strategic in our approach to the environment. Weâ€™re doing this by identifying and minimising the material environmental impacts of our operations, working with our suppliers to improve their environmental performance, and assisting our customers to manage their environmental impacts.